Nearly 80 per cent of total global internet traffic will be driven by video by 2020. Well, that’s the findings of the latest report into video by digital research company L2. This is the second instalment of the annual report titled the L2 Intelligence Report: Video 2016. It evaluates the approach and performance of 200 US consumer brands across seven categories on video, identifying key variables that brands must take into consideration when creating and distributing video content for optimal impact. And it paints a bleak picture for the traditional TV model (although it must be noted the report is from a US consumer perspective). 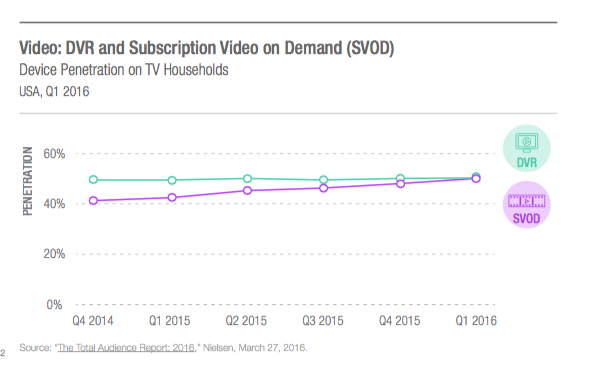 And as viewers switch off TV, digital will be the big winner. “Nearly 80 per cent of total global internet traffic will be driven by video in 2020. Video is now a mobile-first experience, and is expected to account for 77 per cent of all USA mobile data traffic in 2020,” the report said. Spending on digital video advertising is projected to rise in the US from $US7.7 billion this year to $US12.82 in 2018. Most of this will come from mobile video which will see double-digit growth through to 2019. 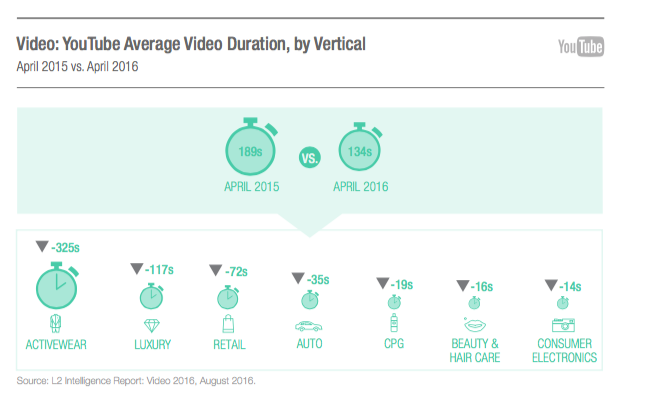 This mobile-first impact on video viewing is already being felt, with the average duration of a YouTube video decreasing more than 60 seconds since April 2015. As digital video soaks up ad spends it will see traditional TV’s revenues continue to erode. “Social and video have, in a scant two years, made a myriad of innovations to offer a wide range of new advertising models and formats to brands. TV’s pace remains glacial, with its best hope to reverse the freezing of advertising revenues, Addressable TV, still at less than two percent of total TV ad spend after four years,” the report said.